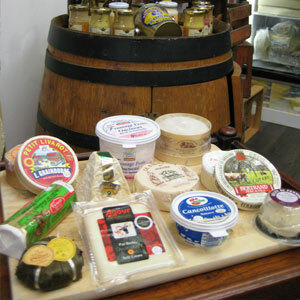 There are hundreds of different French cheeses, each with its own unique style and taste. There are 8 basic cheese production methods (families) being: fresh cheese, an unripened white cheese such as Fromage frais; soft bloomy rind cheeses such as Brie de Meaux; soft washed rind cheeses such as Epoisse; pressed uncooked cheeses such as Reblochon; pressed cooked cheeses such as Beaufort; Blue veined cheeses such as Roquefort; Goat’s cheese and finally processed cheese such as Cancoillotte. 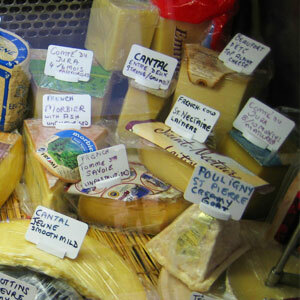 At the French Market we have selected some of the best cheeses in these different families. We can group our cheeses into some more easily recognisable styles for example: Crustless or edible crust cheeses with soft centres such as Brie, Camembert, Epoisses and Munster; Firm textured cheese such as Comte and Beaufort; Blue veined cheeses such as Roquefort and Bleu d’Auvergne; and Goat’s cheese which is very white and tangy. Below is a list of the types of cheeses we offer here at La Crémerie. If you have any question about these cheeses, you are welcome to contact the owner Suzanne, or visit the shop in Garden centre for a free taste of any cheese. Edible crust cheeses can be separated into Fresh cream cheese, Soft bloomy rinds and Washed rinds. Fromage Frais, fresh cheese, is very white and delicate in flavour as it has not been ripened, for example Petit Suisses are little pots of cheese that we eat at breakfast time often with jam. These cheeses are eaten within a couple of weeks of productions. The white bloomy rind cheese is created by applying a white mould to the exterior of the young cheese, this forms an edible crust. The interior starts off firm and slowly softens until it becomes runny when ripe. The exterior develops a rusty colour as it matures. These cheeses are usually eaten within a few weeks of production. The most recognisable and my favourites are the wheels of Brie from Meaux AOC, near Paris and Camembert AOC from Normandy on the north coast of France. The difference in flavour is due to the regional pastures and the ripeness of the cheese. Another cheese in this style is the triple cream cheese Delice from Burgundy, this cheese has fresh cream added during the process and it is quite addictive. The washed rind cheeses are made by shaping the cheese in a wheel then washing it regularly with a liquid. The cheese develops a golden, orange, moist crust with a liquid creamy insides. The aroma is very pungent and the flavour fills one’s mouth. Two of my favourites are Epoisses AOC from Burgundy which is washed with a local brandy, the Marc de Bourgogne, and Munster AOC from Alsace which is washed with herbs. Both of these cheeses develop incredibly strong flavours. Firm textured cheeses can be separated into pressed uncooked cheese such as my favourites Cantal AOC from the Massif central, Morbier AOC from the Jura, St Nectaire AOC from the Dore mountains. Reblochon AOC and the Tomme from Savoie; and the cooked pressed cheeses such as Beaufort AOC from the Savoie and Emmental from the Jura. The best ones are made with unpasteurised milk from cows grazing in the high alpine pastures in summertime. The textures are firm and the flavour fills your mouth but is not overpoweringly strong. These cheeses have a dry crust and are matured for several months. Blue veined cheeses have an amazing range of taste and depend on the particular blue mould spores that are introduced to give the cheese its distinctive flavour and texture. The softest, creamiest Bleu d’Auvergne AOC and the firmer textured Fourme d’Ambert AOC come from the Massif central in the heart of France. Here cheese has been produced for centuries. The strongest and most famous of the blue cheeses that we offer is Roquefort AOC, made from the Lacaune Ewe’s milk cheese which is matured in caves above the town of Roquefort in the south of France. The salty flavour is unique and leaves an unforgettable taste in your mouth. These cheeses can be eaten over a couple of months. Goat’s cheese is easily recognizable as it is very white. It has a distinctive tangy flavour and is delicious on bread or toasted. It comes in several forms, the most well-known is the Buche de Chevre, a cheese made in the shape of a log. This can be made with a crust like the Brie, or without a crust. The second style are the Crottins de chevre, these are small and round in shape, creamy and easy to spread. The third one we sometimes stock is the Pouligny St Pierre AOC, the Rolls Royce of goat’s cheese which has a very recognisable pyramid shape, the exterior is fairly dry and the inside is creamy. The taste is exceptional. If you are interested in getting your hands on any of the cheeses listed above, visit the shop in Gardens centre and taste them for yourself.